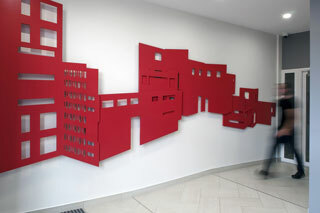 Assembly Lines is a group of sculptural reliefs and wall paintings inspired by the history of the Prospect East site, in particular its time as a railway wagon works and marshalling yard in the late nineteenth and early twentieth century where over 5,000 passenger train vehicles were produced. 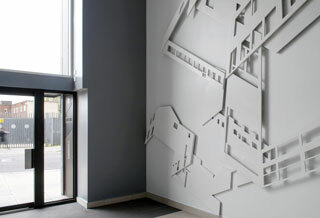 Working with the railway theme, the five wall reliefs are derived from a series of walks undertaken by the artists between the site and five nearby railway stations. London Fieldworks observed and documented the process of gentrification and the changing composition of neighbourhoods through architecture. 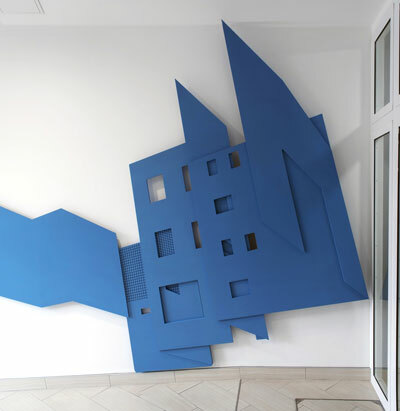 Buildings and structures photographed on each route have been abstracted to create the sculptural relief. 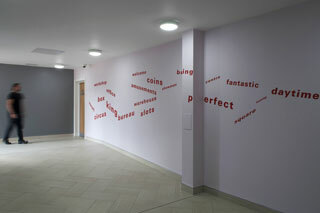 Painted directly onto adjacent walls in each lobby, a series of companion works have been designed from the same walks. 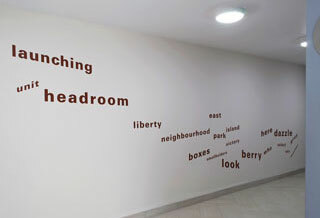 Creating a form of visual poetry, words and colours were taken from the street and applied to the wall, reflecting the shape of the wood reliefs. 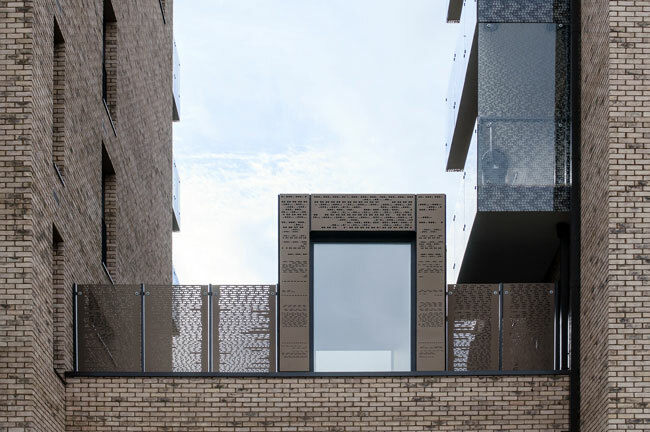 The artists also created designs for the fritting of glass balconies, and the laser cutting and embossing of the metal screens on the facades of each building. This imagery relates directly to the Whyte notation system for classifying steam locomotives by wheel arrangement. Each of the five buildings has a visual identity that is abstracted from one particular engine type. London Fieldworks (Bruce Gilchrist and Jo Joelson) are a Hackney-based art partnership. Their art reflects the interconnections between social, natural and technological worlds. They have undertaken several high profile commissions for, among others, Future City, Cambridge; Dover Street Market, New York and PEER, London. Their practice often responds to the ways in which we interact with the environment around us, and the resulting works employ a diverse range of materials: some highly crafted, others using the latest technologies.